In the European geologic time scale the Mississippian is not recognized as a geologic period, nor the Pennsylvanian. But in this country we separate these rocks because they have such distinctive records. The Mississippian is known for its carbonates and the Pennsylvanian for its coal deposits. In the Mid-Atlantic, the Mississippian divides in three, a lower portion dominated by clastics (the Pocono, Stage J) a middle carbonate portion, the Greenbriar group, and a top portion, the Mauch Chunk. The Pocono is found in the Valley and Ridge, but the Greenbriar carbonates and Mauch Chunk clastics are only exposed in the Allegheny plateau and west. The picture at right is of a quarry along Rt 33 at the east entrance to Canaan Valley, West Virginia. Below are the resistant Greenbriar carbonates (reddish), and above them shales of the Mauch Chunk (brownish); the beginning of the Alleghenian orogeny. The picture to the right is an outcrop of the Greenbriar along Rt 33 east of Elkins W.Va. (located just about at the eastern end of the 4 lane portion of the highway.) Further outcrops are found west down the highway. 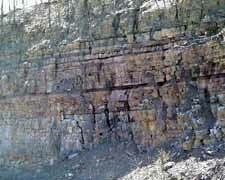 Notice here that there are some interbedded red shales (the Taggert), typical of the Greenbriar. But up close you could see mega-crossbedded (6+ feet high) oolitic and fossiliferous carbonate sands. Good exposures of the Greenbriar are also found along I64 west of White Sulphur Springs, W.Va. These include not only off shore limestones but also tidal flat carbonates. An alert traveler will see through this country the numerous sinkholes dissolved into the carbonates, surface expressions of the caverns also in the region. Virginia has virtually no record of these carbonates. It is possible that a good record existed east of the Allegheny front and it has been since eroded, but more likely it never really got this far east, being kept at bay by the land built out by the prograding clastic wedge of the Acadian orogeny. Carbonates have been around for a long time, and we have encountered them in Stage E (tidal limestones and dolomites), Stage G (fossil rich limestones), and Stage I (tidal, again; and fossiliferous limestones, again). But carbonates have also evolved through time. We cannot explore this evolution here, but by the Mississippian, carbonate deposition takes a unique turn in world history before it changes into something different again. The Mississippian is a period of transition. The transitions are both biological and geological and give the Mississippian a unique character, not like the past, yet not completely like the future. Biologically, at the end of the Devonian was the second of the "big 5" extinctions. Notice in the graph the sharp drop in number of fossil families under the arrow labeled "2". Some groups common in the past were completely wiped out, while others were severely cut back in number and diversity, never to recover. The Mississippian is the period during which life in general recovers and branches out in new directions; notice in the graph how fast the diversity rebounds after the extiction. But we must be cautious here, for diversity and abundance are not the same thing. It is possible for a group to have many species, but each species just not be that abundant; in fact might be hard to find. But very successful groups tend to be both diverse and abundant, and to evolve rapidly. Several Mississippian groups are especially good at the diversity/abundance combination, including echinoderms (crinoids and blastoids), and lacy bryozoans. These groups exits in unimaginable numbers in the Mississippian, and absolutely dominate the record, at least for a time. By the end of the Paleozoic most of these groups will go extinct. Geologically, several things happen in the Mississippian. The beginning of the period saw the last of the Acadian orogeny, and by the end of the period the Alleghenian orogeny (Mauch Chunk formation) had begun. 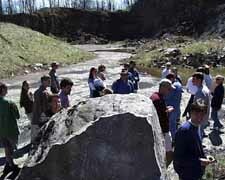 In Virginia and West Virginia the most characteristic Mississippian rocks are in the Greenbriar formation. The Greenbriar tells of a very warm, shallow, clear, highly agitated sea with an abundance of invertebrate life. Important sediments include oolites, and coarse crystalline limestones composed almost completely of crinoidal fossil fragments. Oolites are tiny spheres of calcite that look like miniature pearls. The right picture is of the same quarry as the top picture, only here the large block of limestone in the foreground is almost all oolites, with a few fossils scattered in. Blocks and pieces like this can be found throughout the quarry, and along Rt. 33 down the hill where the rest of the Greenbriar is exposed. We have a good understanding of how oolites form because they are seen forming today in places like the Bahamas. Oolites form only in very warm, clear shallow water that is highly agitated by waves or tidal currents. The oolites form in large underwater dunes that continuously shift about on the sea floor. Oolites, while forming, act like individual sand grains but in the Greenbriar are cemented together as a rock. So, while standing in the quarry, especially on a winter day, we have to imagine the scene not as it is now, but when the oolites were forming. Water so clear you can easily see the bottom. And when the tide is out oolitic dunes you can stand on, dry shod. But when the tide comes in the water rushes by so strong you probably cannot stand up in it. And somewhere off on the horizon to the east, probably not that far away and without an obstruction in sight to block the view, tidal flats lapping up onto the edge of the old clastic Acadian wedge and peneplain. And if we turn around and look west? Epicontinental sea as far as the eye can see; indeed as far as the Rocky Mountain region. Other limestones are made mostly of crinoid fragments, with lacy bryozoans and other fossils mixed in, and are called encrinoidal limestones. The number of individual crinoid animals required to form some of these beds is truly unimaginable. For one formation in Kentucky it has been estimated 28 x1016 (280,000,000,000,000,000) individual crinoids are required. Swimming over this sea bottom must be like swimming over a vast, chock-full, flower garden stretching as far as the eye can see. And among all these crinoids are corals, blastoids, and brachiopods. White carbonate beach sands and tidal flat deposits are present in eastern outcrops indicating the presence of shorelines, but how far east into Virginia the shore came is unknown. No other geologic record exists of what the rest of Virginia was like during deposition of the Greenbriar. It must of had some relief at times since clastics occasionally enter the Greenbriar sea. Yet for the most part Virginia was, again, at the end of the Acadian orogeny, a peneplain, from near its western boundary all the way east to Richmond, and beyond. And beyond that the Rheic ocean, and beyond that, and not too far away, the supercontinent Gondwana, closing fast. These shallow water carbonates, oolites and encrinites, are not just found in the Mid-Atlantic region, but were deposited across most of North America during this time, all the way out to the southeast and up through Nevada. The vast extend of these clear water environmental conditions is in sharp contrast to the earlier Chattanooga Shale deposited during the Devonian Acadian orogeny when the epicontinental seas were under the influence of very stagnant conditions across most of the continent. On the other hand, if we travel to the northeast, away from the craton, Mississippian carbonates become more and more scarce, and disappear. Instead, clastics prevail almost without interruption from the end of the Acadian to the beginning of the next orogeny. In fact, it is likely that these two orogenies in the northeast run together and overlap. The implication is that no sooner had the Avalon terrane collided, built a mountain range and then mostly eroded, than the supercontinent Gondwana began its collision to start the next orogeny, an event to profoundly rearrange the geologic record of the Mid-Atlantic. But that is the Alleghenian orogeny, our next subject.